This post has been in my head for ages. A few years ago, some amazing pieces of street art started popping up all over the city. I never knew when I’d turn a corner and see a formerly bare wall now covered with an image that would make me think, wonder, or just feel grateful for the beauty. 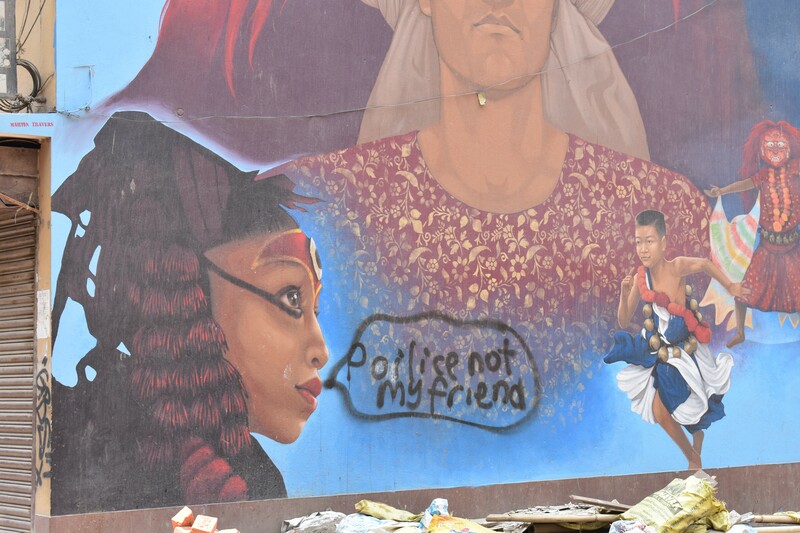 I have been taking pictures of them for years, spurred on when several pieces vanished after the walls or buildings they adorned got torn down. 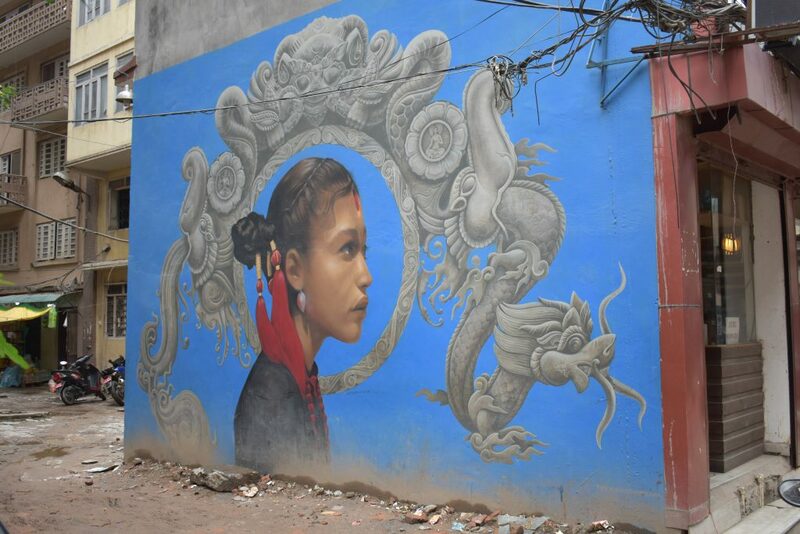 Today I took the photo below, on a side alley off Paknajol, behind Thamel, of a piece I was seeing for the first time. The others were taken earlier this year; I’ll track down the older photos for a future post, but for now, enjoy. To the best of my knowledge all of these are still up and can be viewed at the location noted. Since joining ECS Nepal as editor in January of 2017, I’ve done a lot more writing for the magazine, rather too much to post it all here. When I have time, though, I’ll still be linking to work published – like the article below, one of my recent favourites. 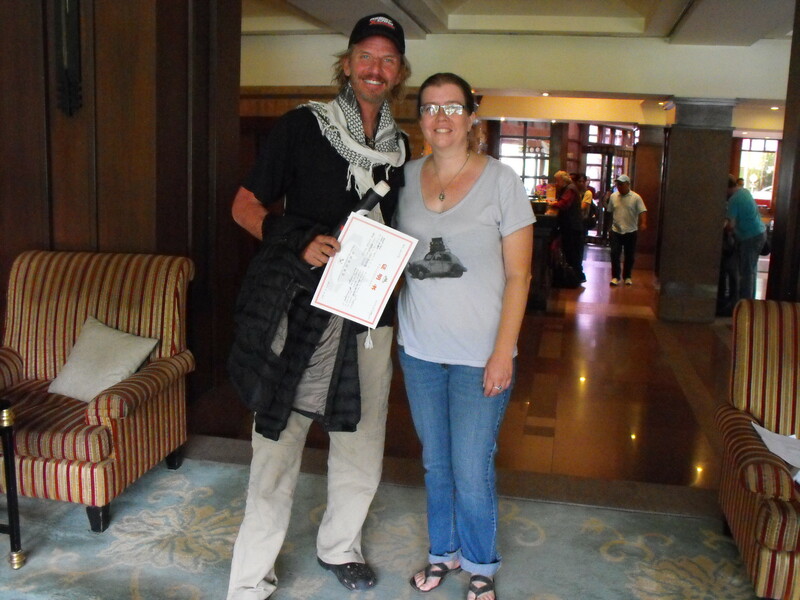 On Wednesday I had the opportunity to interview Facundo Arana, an Argentinian singer and actor who summitted Everest this climbing season. It was a fascinating experience and he was a lovely person; if you’re interested you can read the interview here. Check out this article with amazing photographs of a leopard that wandered into a residential area in Kathmandu this morning. Thankfully no one was hurt and the leopard was also safely tranquilized by personnel from the city zoo. It’s pretty amazing, though! I’m writing for a new Nepali news site! Last month I became a regular contributor to the english edition of a new Nepali news portal, OnlineKhabar. It’s a really great site that features a lot of interesting articles from a local perspective, and they contacted me after seeing my work with ECS and Friday. I’m really thrilled to be working with them — two of my pieces have already gone up – links are below – do let me know what you think! 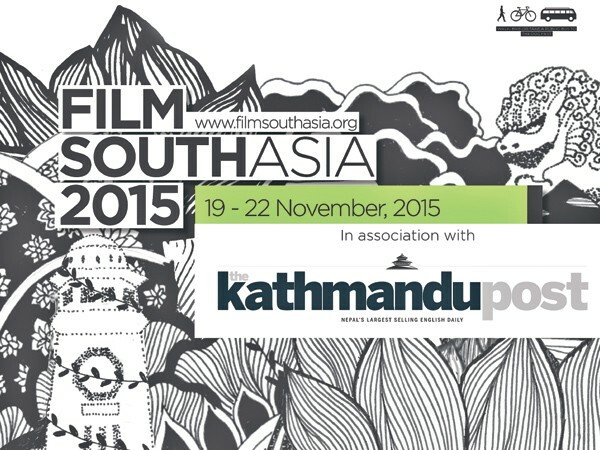 What to do in Kathmandu: 10th Asian Documentary Film Festival on now! Today I was invited to attend the opening of Film South Asia 2015, a South Asian documentary Film Festival that is held every two years. As we all took our seats in the cozy theater, there was an announcement, “In the likely event of a tremor, there are two emergency exits there, and there.” This was greeted by a wave of laughter; I’m not sure if “in the unlikely event” was meant to be humorous or not, but this morning at 10 am there was a 5.3 tremor here in Kathmandu, the first one I’ve personally felt in a while, and I’m sure it was on everyone’s mind. While it wasn’t that strong, it seemed quite long. More about it here. 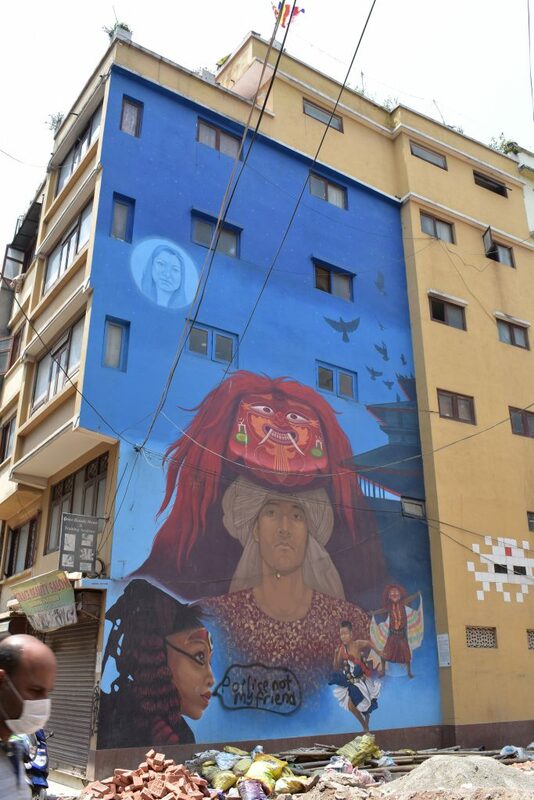 The documentary screened at the opening was Drawing the Tiger, directed by Ramyata Limbu, Amy Benson and Scott Squire, and filmed here in Nepal over a period of seven years. The film follows a young girl from Ramechhap District who comes to Kathmandu to pursue her education, and the ripple effect this action has on her entire family. I am glad I didn’t know much more than that when I sat down, as the film was a beautiful and moving experience, including an emotional sucker-punch I was not expecting, perhaps extra difficult for me as I also have the Humla girls I’m helping to educate so it hit really close to home. If you have a chance to see this film, I couldn’t recommend it highly enough: it’s a simple, honest piece and a great sample of ‘show, don’t tell.’ Even documentaries sometimes get carried away in trying to make a point via omnipresent narrator or other methods, but despite the subject matter, this film did nothing of the sort. The only people you heard from were each of the family members involved, and the result was touching, honest, and surprisingly revealing. More about the film at its website here, though be warned that it also tells quite a bit about the story that I was glad I didn’t know ahead of time. The festival continues for three full days: tomorrow, Friday November 20th, Saturday the 21st and Sunday the 22cond. It’s being held at Yala Maya Kendra, Patan Dhoka, in Lalitpur, with between 8 to 15 documentaries of various lengths being screened on each of the three days. Each film costs just 50 rs. to attend, and are from all over the region–Afghanistan, Myanmar, Sri Lanka, India, Bangladesh, Pakistan, and of course, Nepal. The screenings begin around 10 am each day and continue to 5 or 6. 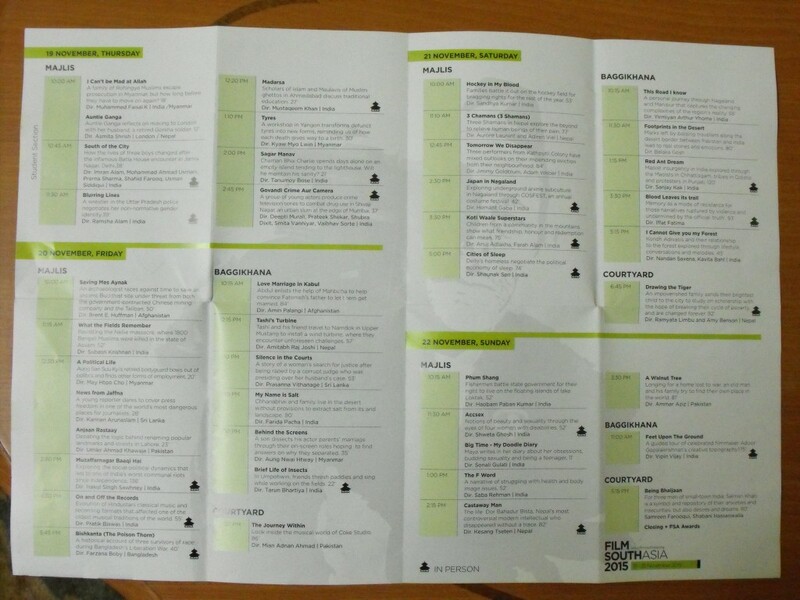 For details of which films are shown on which days, you can check out their website, http://www.filmsouthasia.org; unfortunately I had a hard time accessing the site and if you do too, you can click on the high-res picture I took of my programme below to embiggen it and see what the choices and timings are. This is a really great chance to see some of the best recent documentaries from this part of the world and I recommend that if you’re in Kathmandu you take full advantage of it! I imagine that for many of you who read this, it’s hard to imagine living in a country that is almost completely dependent upon its neighbours for most basic necessities. But that’s Nepal — landlocked, we share borders with only India and China, and that northern border is pretty much the Himalayas, with only one narrow road in. 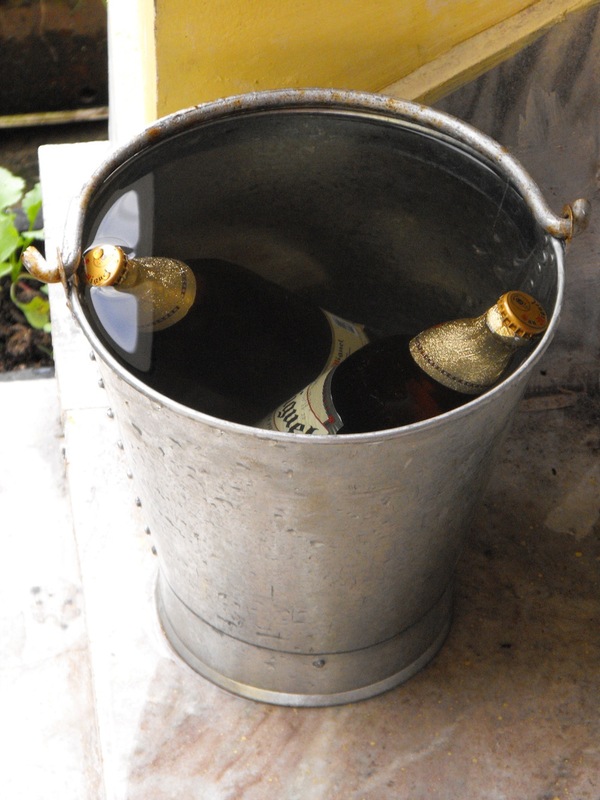 So, much of what we need–and all fuel/petroleum products–come in through the Terai, from India. 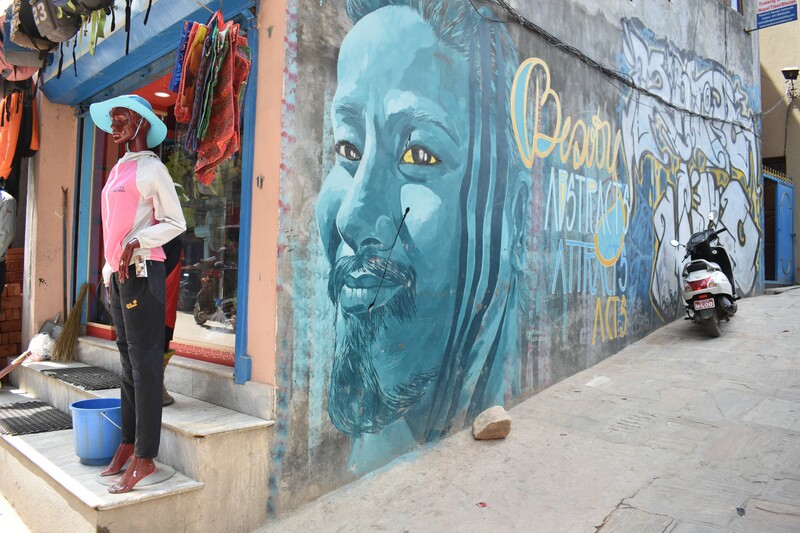 When the new constitution–years in the making–was finally ratified over a month ago now, it triggered protests in the south and a near complete border closure from India. We kept thinking that things had to get better, any minute now, but they haven’t; they’ve only gotten worse. Gas bottles, petrol, diesel, kerosene–none of this is available to buy, unless you are one of those who can afford to pay the black market prices, which friends tell me run at 5-10 times the normal rate. And of course, the people that suffer the most are the poor, particularly those who have been affected by the earthquake. Any appliances that can be used for electric cooking are flying off the shelves, and even here in Kathmandu I see people cooking on the sidewalk using firewood. By comparison, I’ve been fortunate, so far just inconvenienced and not suffering, as so many are. 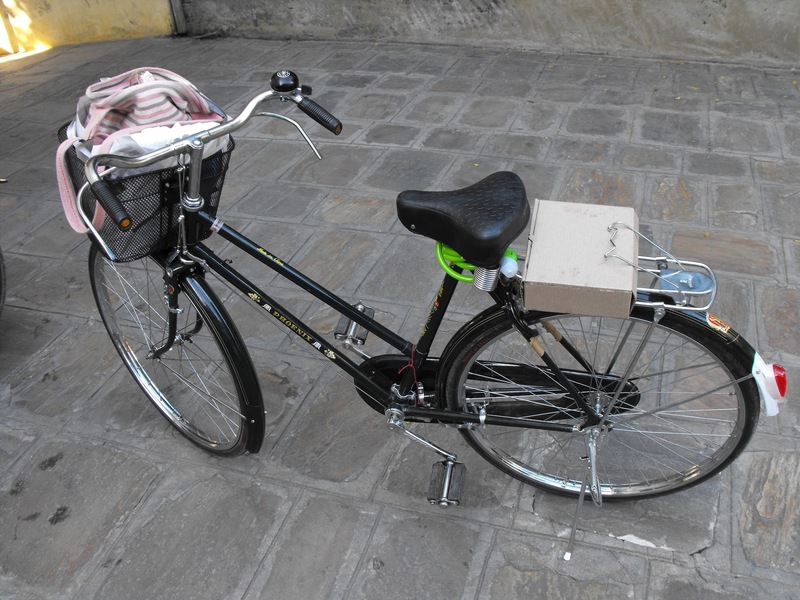 I’m pretty used to short-term shortages, so I always keep a little bit of petrol saved for my scooter, but as I want to keep that for emergencies, I just bought a cheap bicycle (possibly too cheap, it already rattles 🙂 ) and, looking on the bright side, it’s helping me get some exercise. I’m not sure how much cooking gas is left in the my cylinder, and my spare is empty, as I changed it right when the shortage first began last month and have been unable to refill it since. But I do have an old but trusty little electric oven and a kettle, and I’m experimenting with how much I can do without having to turn on a gas burner. When I go out, if a restaurant is open, I eat there — the new logic of “eat out, save your gas” overriding the former logic of “eat at home, save money.” And besides, I figure they could use the business. But every day, more and more businesses of all sorts are staying closed when they can’t find the supplies to stay open. And now shops are starting to run out of certain things, too, because the vehicles that usually supply them don’t have petrol to move around, either. Winter Is Coming, and that means the ubiquitous long power cuts that will rule out the oven and kettle, and no kerosene for heating. I haven’t wanted to write about this, because I feel like there’s been so much bad news out of Nepal lately that I hate to add to it. As always, I am amazed by the cheerfulness and resilience of those around me. But they deserve better, and I can only hope the end is in sight. 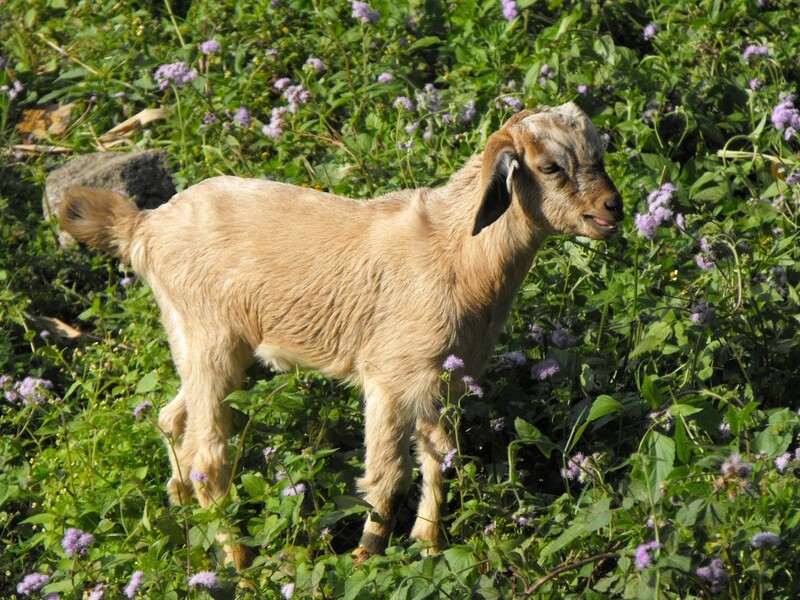 And here’s a picture of a baby goat I saw the other day when visiting a friend, because it’s adorable and makes me smile. I’ve been having trouble sleeping lately, and it’s often 4 or 5 am with the sky just beginning to lighten when I can finally drop off. Yesterday I didn’t fall asleep until past 3, and later found out I’d slept soundly through a 5.5 tremor that happened at about 7:30 am. Later in the day, I told a friend it worried me that I’d been able to sleep right through it. I might have been in danger. “Don’t worry, it was only a 5.5,” she replied. A few seconds later it hit us: who could have imagine a month ago that we’d be sitting here calmly dismissing an earthquake that was 5.5 on the Richter scale?